There’s a magic in building audio amplifiers that I’ve never found in a thousand microprocessor projects and — if that amplifier happens to glow in the dark with the soft light of vacuum tube filaments — so much the better. 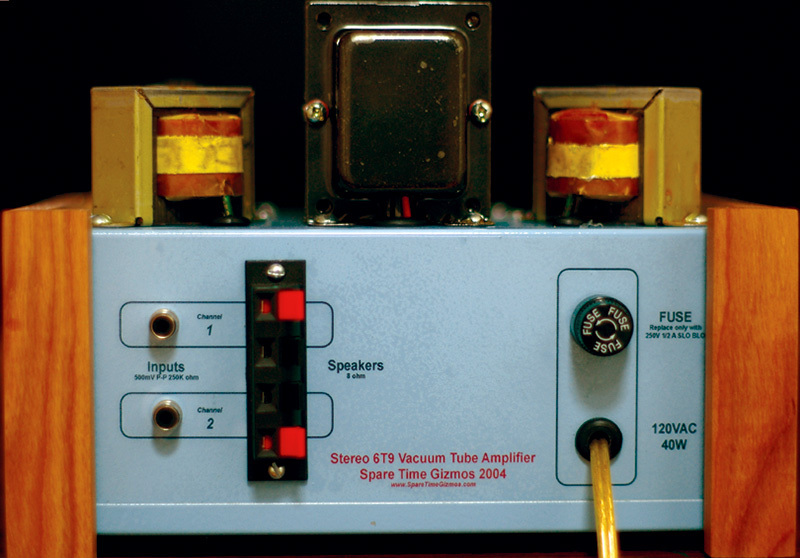 This project, shown in FIGURE 1 at the top with a small MP3 player, is a simple introduction to vacuum tube amplifiers. 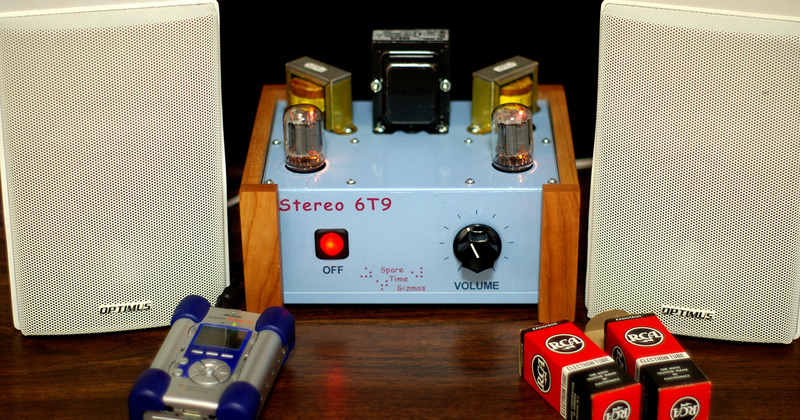 No one will accuse it of being HiFi, but it’s easy to assemble using a printed circuit board, uses only a handful of readily available components, and — best of all — the vacuum tubes and transformers used are cheap enough to not break the bank, even if you have to buy them brand new. Output power from this stereo amplifier is approximately 4 W per channel. If you mount it in a nice enclosure and give it a pair of efficient speakers to work with, it makes a pleasant amplifier for a PC sound card or a portable CD or MP3 player. Yes, it is anachronistic to use a vacuum tube amplifier with a PC and your coworkers will probably think you’re slightly off balance, but that’s part of the appeal. Unlike battery-operated transistor or IC circuits, vacuum tubes can be dangerous. Not only is this project powered from the AC power line, but it contains voltages as high as 500 volts. These voltages can be lethal! The safest way to work on this circuit is to always disconnect the power before making any changes or connecting any test probes. Make sure that you are well clear of the circuit and any test leads before applying power. If you must work on it while it is on, always think about where both of your hands are! Follow the old radio man’s rule of keeping one hand in your pocket at all times. Remember that high voltage capacitors such as C1 and C2 can store lethal voltages for hours after the power is removed. This circuit has a bleeder resistor — R3 — which normally drains the charge from these capacitors within a few seconds, but never assume that it’s working. Resistors can fail, so always check the voltage on these capacitors or short them out before working on the circuit. Finally, power tubes — such as the 6T9 — get very hot in normal usage. You can easily get burned by touching the 6T9 envelope! Figure 2 shows the schematic for one channel of the Stereo 6T9 amplifier; the other channel is identical. FIGURE 2. One channel of the Stereo 6T9 amplifier. With the exception of V1/V2 and T1/T2, all parts numbered 1xx (e.g., R101, C104, etc.) are part of channel one and parts numbered 2xx (e.g. R201, C204) are the corresponding parts for channel two. The circuit used is a classic two stage amplifier. The triode section of V1 serves as a voltage amplifier with a gain of approximately 10-15x and the pentode section is a power amplifier with an audio output of around 4 watts. 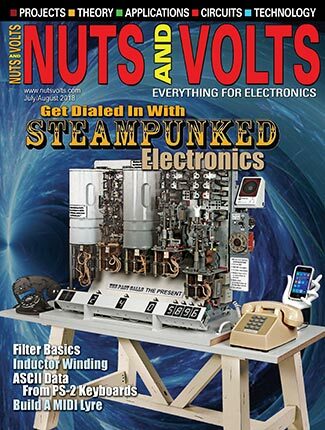 If you do not know anything about how vacuum tubes work, you might want to read the sidebar before reading further. Capacitors C101/C201 AC couple the signal to the grid of the triode section and block any possible DC offset from the signal source that might affect our bias. Resistors R101/R201 are “grid leak” resistors — they ensure that the grid has a DC path to ground. Of all the electrons that pass from the cathode to the plate of the tube, a few will strike the grid by pure chance. Unless these electrons have some place to go, they will accumulate on the grid and cause it to build up a steadily increasing negative voltage. Eventually, enough electrons build up on the grid to completely block any current flow to the plate and the tube stops working. The grid leak resistors give these extra electrons a path to ground. Resistors R102/R202 develop approximately 1.4 V drop because of the plate current of around 0.6 mA that always flows through the triode. 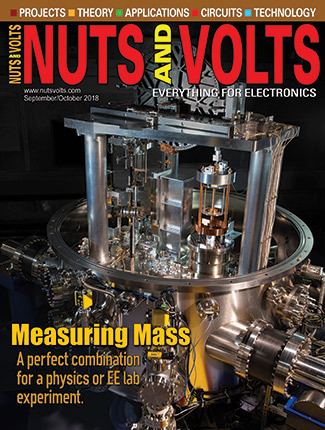 By raising the voltage of the cathode to +1.4 V, we effectively give a negative bias of -1.4 V to the grid of the tube — a technique known in the vacuum tube world as self bias. It is very similar to a transistor amplifier, but — unlike transistors — tubes can be operated with either a positive or negative voltage on the grid and it is possible to operate a tube stage without any bias at all. In this case, the -1.4 V bias on the tube is to put us into a more linear portion of the tube’s operating curve and reduce the distortion. Vacuum tubes are essentially voltage controlled current sources and the changes in the grid voltage caused by the input signal cause a corresponding change in the plate current, which appears as a larger change in the voltage across the 120K plate resistors, R103/R203. This amplified signal voltage is coupled to the next stage by DC blocking capacitors C102/C202. 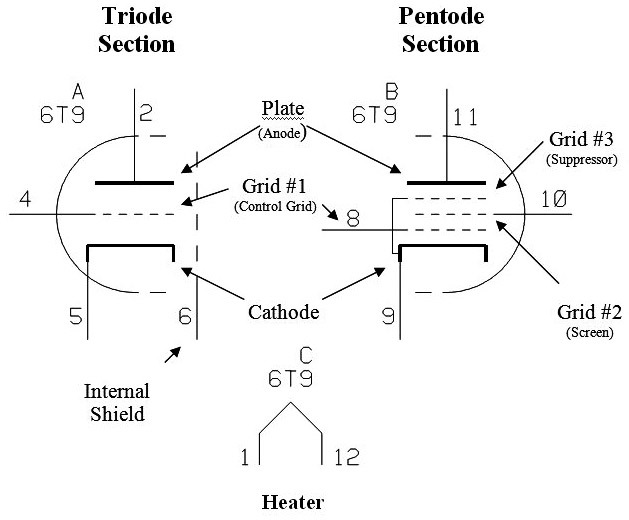 The operation of the pentode stage is very similar. In this case, R104/R204 are the grid leak resistors and approximately 8 V of cathode bias is developed by R105/R205. This much larger bias voltage is developed by the much larger plate current of the pentode — approximately 30 mA — and is necessary because of the larger signal level applied to the pentode’s grid. In this stage, the cathode resistor is bypassed by 100 mF capacitors — C104/C204 — which place the cathode at AC ground and increase the gain of this stage. By the way, it would have been desirable to use similar bypass capacitors on the triode stage, but they would have defeated the negative feedback applied there. In the case of the pentode, there is no plate load resistor — the output transformers T1/T2 take its place and match the relatively high — approximately 5K — plate load impedance of the pentode to an 8 Ω loudspeaker. Resistors R107/R207 apply the screen voltage to the pentode section and are there to prevent parasitic oscillations. Their value is too small to have any appreciable voltage drop under normal conditions. Resistors R108/R208 couple a small portion of the output signal back to the cathode of the triode section. A positive voltage at the output will raise the cathode voltage which has the result of canceling the input signal. This is called negative feedback and, while it might seem like a strange thing to do, it is actually quite beneficial. The effect is that any signal component that appears in the output of the amplifier — but which is not in the input (e.g., distortion, noise, etc.) 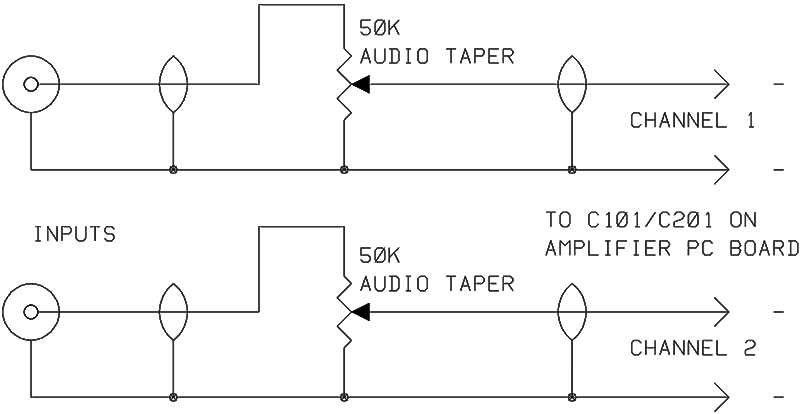 — cancels itself out by creating a corresponding negative correction at the input of the amplifier. Negative feedback reduces the distortion in the output of the amplifier; it flattens the frequency response and improves the damping factor. It’s worthwhile to note that many very high end amplifiers forgo negative feedback because it can lead to other undesirable secondary effects; however, in a simple amplifier like this one, negative feedback offers a big improvement. Capacitors C105/C205 increase the amount of negative feedback at very high frequencies and are there to prevent the amplifier from oscillating at ultrasonic frequencies. Figure 3 shows the schematic of the Stereo 6T9 power supply. FIGURE 3. Stereo 6T9 power supply. The power supply is very simple, using a full wave center tapped rectifier followed by two stages of RC filtering. In older days, an LC filter would have been used instead, but inductors are large, heavy, and expensive. Today, there are much better electrolytic capacitors available than there were back then and it’s possible to get by using a resistor instead of the filter choke. Resistors R106/R206 and capacitors C103/C203 provide extra filtering for the triode section’s plate supply, which further minimizes the amount of hum present at this sensitive stage. 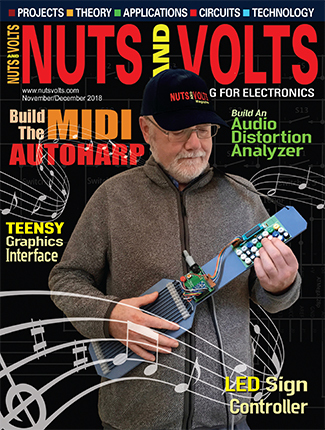 You can easily build this amplifier using entirely point-to-point wiring; however, a printed circuit board makes construction a breeze and eliminates a lot of the opportunities for error. A double-sided, silk screened, and solder masked PC board is available from the source specified in the Parts List, and the images are available in the downloads, at the end of this article. If you use the PC board, remember that it mounts upside-down in the enclosure so that the tube sockets need to be mounted on the solder side (that is, the side without the silk screen) of the board. All other components mount on the component (silk screen) side. Capacitor C2 is large and heavy enough that the leads alone are not sufficient to secure it to the PC board; so, after soldering, wrap a wire tie around the middle of C2 and through the two holes provided in the PC board to hold it in place. The power resistors — R1, R2, and R3 — get quite hot in normal operation and should not be installed touching the PC board. Leave about a 1/8” to 1/4” air gap underneath these resistors when soldering them to allow air flow around them and to prevent heat damage to the PC board. You may have trouble finding 400 V capacitors for C102/C202, but these parts are subjected to the maximum power supply voltage during the vacuum tube warm up period and any lower voltage rating is not safe. Also, avoid using ceramic capacitors for C105/C205. Ceramic capacitors have poor sound quality and should never be used in audio equipment — always use film type capacitors instead. Shielded cable — preferably RG-174 miniature coax — must be used for the wiring between the PC board, the volume control (if you use one), and the input jacks. The shielded cable should be run right up to the PC board so that no more than 1/4” or so of unshielded center conductor is exposed at the connection. If you elect to build the amplifier without a PC board, use care to keep the lead lengths around the triode’s grid — pin 4 — as short as possible. 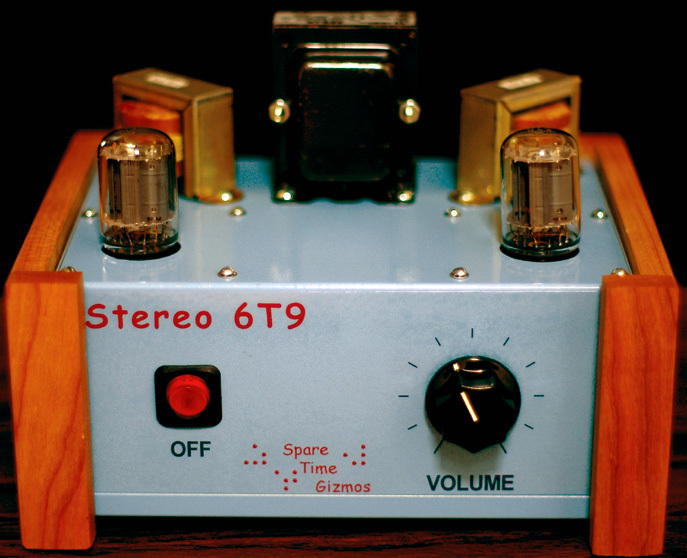 The 6T9 packs a fair amount of gain into a small space, not to mention that there are almost 200 volts of audio AC on the pentode’s plate and it only takes the smallest amount of coupling to the triode’s grid to induce feedback and oscillation. The PC board layout is carefully arranged to provide maximum isolation for pin 4 and you shouldn’t have any problems with it, so long as you remember to use shielded cable. Solderless screw terminal strips are used for all connections to the PC board, except the shielded input leads. These are optional, of course — you can just solder the wires directly to the PC board — but, if you ever need to remove the PC board for repair, you’ll be glad that they are there! The PC board should be mounted in the chassis upside-down using 7/16” standoffs and #4-40 hardware. The solder side and the tube sockets face up and the sockets protrude through 1-1/8” holes in the chassis. If the standoffs are correct, then the top of the tube sockets should be just about flush with the chassis. Be sure that none of the solder joints on the bottom of the PC board short to the chassis! Figure 6 shows the interior of the assembled Stereo 6T9. FIGURE 6. Interior of the Stereo 6T9. The long transformer leads may look messy, but the usual wisdom is to never cut them off. Transformers are very expensive and you don’t know when you might want to re-use them in a different project! Wire ties can be used to keep the high voltage leads neatly bundled and away from the sensitive inputs. If you examine the PC board, you’ll see large areas of copper that are the circuit ground. Notice that these areas do not form a complete loop around the outside of the PC board because to do so would form a ground loop. Also notice that the eight mounting holes are isolated from the ground plane and — when you install your PC board in a metal case — you should make sure that the mounting screws do not inadvertently touch the PC board ground plane. The entire circuit should be grounded to the metal case at exactly one point — the input jacks — through the shield of the input coaxial cable. Grounding the circuit to the metal case at more than one point will always result in ground loop problems. 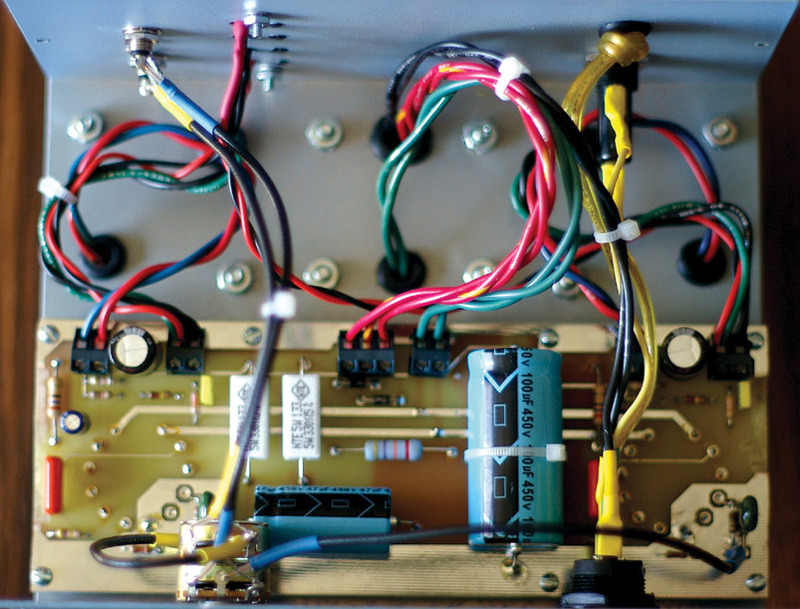 If you build your amplifier without a PC board, then you should try to duplicate this grounding arrangement. The usual way to do this is to run a bare piece of heavy gauge copper wire the length of the chassis and support it with insulated standoffs. All ground connections should be made to this wire and then the wire is connected to the chassis at one and only one point — the input jacks. Ground loops can be a serious problem if a three-wire power cord is used and the amplifier is connected to another device with a three-wire power cord, such as a PC. The simplest solution is to use a two-wire line cord for the amplifier and avoid this problem completely, but this raises safety issues. The only way to both be safe and avoid ground loops is to completely separate the signal ground from the power ground. Since — if you did everything right — the signal ground is only connected to the case at one point — the input jacks — this is easy enough to do by using insulated washers to isolate the RCA jacks from the metal case. Now you can connect the power ground (that green/yellow wire in the power cord) to a ground lug installed under one of the power transformer’s mounting screws. This will work, but — if you ever operate the amplifier while it’s connected to an ungrounded device (such as a battery-operated CD or MP3 player) — then you’ll have hum because the amplifier case is no longer connected to the signal ground. To fix this problem, you need to connect a small, 0.01 µF capacitor between the signal ground (at the RCA input jacks) and the chassis. Be sure to use a capacitor rated for AC line service. When you’ve completed the wiring, go back and double check everything again. Look particularly for short circuits around the high voltage components (e.g., D1, D2, C1, C2, R1, R2, and R3) — an accidental solder bridge here will destroy components! Be sure that C1 and C2 are installed in the correct orientation with the negative side connected to the ground plane. Electrolytic capacitors can explode if connected backward! When you’re ready to proceed, attach two speakers to the output terminals, but don’t make any connections to the inputs yet. Before you plug it in, connect a DC voltmeter set to at least a 1,000 VDC scale to ground and the positive side of C2. Pay careful attention to how you make this connection — remember, the voltmeter leads will have at least 400 V on them when you apply power, so be absolutely certain that there’s no way you can accidentally touch one or cause one to contact any metal parts. Turn on the power and the voltage on C2 should immediately rise to about 375 V. You’ll see the tube filaments (there are two in each tube) glow and — after about a 10 second warm up — the voltage on C2 should drop to approximately 250 V. If the initial voltage exceeds 450 V or if it doesn’t drop to something below 275 V after 10 or 15 seconds, immediately turn off the power and figure out what you did wrong. If all is well, turn off the power, connect a signal source (your PC, an MP3 or CD player, or something like that) and turn it back on. After a short warm up period, you should be rewarded with music from the speakers. If you hear a terrible howling or screeching sound — like feedback — then that’s exactly what it is — feedback. If you use the transformers specified in the Parts List and follow the color code shown, then you shouldn’t have this problem, but if you use a different transformer it is possible that the polarity of the output is reversed. This turns the negative feedback into positive feedback and that turns the amplifier into an oscillator! The fix is easy — just reverse the leads for either the primary or secondary (but not both) winding on the output transformer. FIGURE 7. Adding a volume control. If you find that you need more gain, you can experiment with increasing the value of the feedback resistors, R108/R208. Increasing these values will decrease the negative feedback and, in turn, increase the overall gain, but at the cost of some sound quality. You can also try looking for more efficient loudspeakers; with the right speakers even a 3-4 W amplifier like this one can play amazingly loud. Because this amplifier uses solid state rectifiers in the power supply, the high voltage is applied to the tubes the instant the power is switched on. Applying high voltage to tubes before the filaments have had a chance to warm up is often considered a bad practice and can lead to a phenomenon known as cathode stripping, which shortens the lifetime of the tubes. 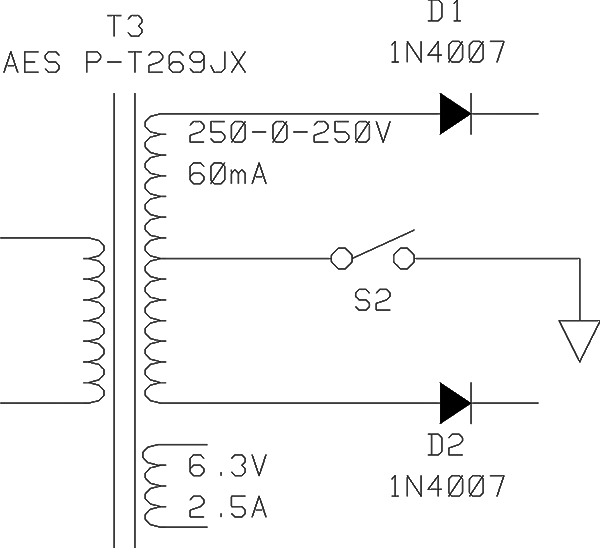 Figure 8 shows how you can add an additional switch (S2) to control the high voltage separately. FIGURE 8. Delayed turn on switch. To turn the amplifier on, you turn on S1 (First, make sure that S2 is off!) to warm up the filaments without any high voltage present. After waiting 15 to 20 seconds, you then turn on S2 to apply the high voltage to the tubes. When you’re done using the amplifier, you normally switch off both S1 and S2 at the same time. FIGURE 9. X-ray view of the printed circuit board layout. All resistors are 1/4W 5% carbon composition unless otherwise specified. AES is Antique Electronic Supply, 6221 S Maple Ave, Tempe AZ 85283 USA, (800) 706-6789 or (480) 820-5411, www.tubesandmore.com. Digi-Key Corporation, 701 Brooks Avenue South, Thief River Falls MN 56701 USA, (800) 344-4539 or (218) 681-6674, www.digikey.com. If you live outside the US, you can order from Radio Shack at [url=http://www.radioshack.com]http://www.radioshack.com[/url]. Otherwise there’s probably one in your neighborhood. There is a very limited number of double-sided, silk screened, and solder masked PC boards available for this project, for purchase from the author. Contact [email protected] for more information. You may download a full sized drilling guide (just print it out, tape it to the box and drill where you see “X”!) for the chassis, and the artwork for the decals that you see in the photographs from www.SpareTimeGizmos.com/Download.htm, as well as from the article downloads below. In 1883, Thomas Edison — while trying to improve his light bulb — decided to place a metal plate inside the glass envelope along with the filament. No one knows why he did this, but Edison — who was always somewhat of a tinkerer — was probably just guessing. In any case, the plate did nothing to help his light bulb and he gave up on it, but not before he noticed that a current would flow if the plate was connected to the filament. We know today that the electrons orbiting the atoms of the filament had enough energy at the white hot temperatures to escape from the filament and form an electron “cloud” inside the tube. The electrons, which are negatively charged, would be attracted to a positively charged metal plate and allow a current (which after all, is nothing more than a movement of electrons) to flow between the filament and the plate. Edison had just invented the first vacuum tube (a diode), but it would take another decade before the physicist J. J. Thomson would discover the existence of the electron and Edison never had any idea how or why his tube worked. 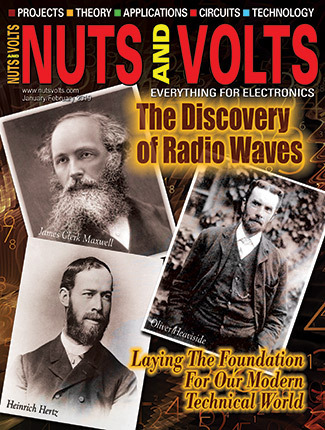 It was Sir John Fleming — who had been working in Edison’s labs in 1883 — who had the idea of applying the vacuum tube to radio reception; however, as a simple diode, it couldn’t do much. It wasn’t until 1906 that Lee DeForest had the idea to place a third element in the tube — a fine coil of wire between the filament and the plate. By applying a negative voltage to this coil of wire, it could repel the electrons and prevent them from ever reaching the plate; conversely, applying a positive voltage to the grid would cause even more electrons to speed toward it, pass between the coils of wire, and hit the plate. Thus, a fairly small change in the voltage on the grid could cause a large change in the plate current and now the vacuum tube could amplify it. The 6T9 tube used in this project was designed by Sylvania in the 1950s and it actually contains two separate, independent tubes in the same glass envelope; it’s a little like an integrated circuit from the vacuum tube era! The first part is a triode — not all that different from the one Deforest invented in 1906. The audio voltage is applied to the grid and the resulting change in the plate current causes a much larger voltage to be developed across the plate resistor. This amplified voltage is then coupled to the grid of the second section of the 6T9. The second half of the 6T9 is a pentode — a tube with no less than three grids. All triode amplifiers suffer from the problem that the plate current depends to some extent on the plate voltage in addition to the grid voltage and the plate voltage naturally changes as it follows the signal that we’re amplifying. This tends to make the tube “oppose itself” and cancels out a part of its gain. While we can’t prevent the plate voltage from changing with the signal, we can make the plate current insensitive to the plate voltage by adding what will be a fourth grid — called a screen grid — between the first grid and the plate. If this fourth grid is connected to a large, fixed positive voltage, then it does the work of attracting electrons to the plate and the number of electrons reaching the plate no longer depends on the plate voltage. The third and final grid — called the suppressor grid — is placed between the screen grid and the plate. If there were no suppressor grid, the fast moving electrons would tend to strike the plate and bounce off, returning to the positively charged screen grid. This has the effect of reducing the plate current and increasing the screen grid current, which doesn’t help us amplify at all. By connecting the suppressor grid to a negative voltage and placing it between the plate and screen, we can prevent those electrons from leaving the plate and increase the power output of the tube. Schematic symbol for the 6T9 vacuum tube. If you live outside the US or there's not one in your neighborhood, you can order from RadioShack at www.radioshack.com. Capacitors C102/C202 are 0.01 µF 400V "Orange Drop" components from Antique Electronic Supply (AES). Unfortunately, the AES part number given, C-PD022-400, is for a 0.022µF capacitor — the correct part number for the 0.01µF component is C-PD-01-400. If you already bought the 0.022µF capacitor then there's no need to return it — it'll work just fine in this circuit, however you may have to "form" the leads a bit to get it to fit on the PC board. In the power supply schematic the 47K 2W bleeder resistor is marked "R1" but it's actually R3 in the parts list. Spare Time Gizmos is currently shipping Revision D of the 6T9 printed circuit board. This differs from the one described in the article in that an additional 47µF 450V filter capacitor, C3, has been added in parallel with C1. This will reduce residual hum in the power supply to inaudible levels. C3 is shown in the current schematics from our downloads page, but not in the article.